How Good is Your Pilot Study? A good design starts with a careful and complete water analysis – because all waters are different and respond differently to treatment. Frequently, a water analysis alone may not be sufficient information to conclusively move toward a final design, and in these cases, a pilot study is required. A dependable, high quality pilot study, like many services encountered in the water industry, is reflective of the ultimate relationship an engineer or City may have with a chosen responsible manufacturer. Can the pilot study and protocol be customized to my client’s needs? Is the pilot resource experienced, dependable and known for providing sound advice? If a pilot study has the characteristics of being “generic”, “quick and dirty” or “cheap”, it’s likely that moving quickly to a quality design will be difficult – many times these “quickie” pilots create more uncertainties and less clarity than they answer. On the other hand, thoughtful, customized protocols and meaningful input from experienced system manufacturers, who know piloting, can aid the design team in moving toward a systematic approach with a quality result. In the last twelve months, Tonka has worked together with consultants to conduct more than 40 customized pilot studies. These have ranged from cold Canadian surface waters targeting turbidity and organics to Southern US well waters with iron, manganese, H2S and radionuclides. Our repertoire of available equipment and processes, and our track record of robust engineering support and timely report completion is the best in the business. 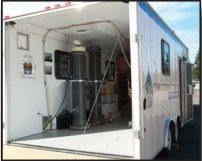 Let us help you by drawing on our experience with over 1900 installations and our particular knowledge regarding specialized contaminants and processes. We have state-of-the-art piloting expertise in many areas, including: radium, TOC, arsenic, UF membranes, NF and RO membranes, high rate media and many others. Tap into Tonka’s piloting expertise—call us for reliable, dependable pilot information for your design project. We guarantee that we’ll listen and work hard with you to meet the challenges that lie ahead.